Testing the webcam mic for Skype lessons some time ago. Not too bad all things considered and will work just fine. Using a Logitech HD Pro C920. The best 60 minutes you will spend NOT playing guitar – A conversation with Steve Vai at Musicians Institute, California. In this edited 60 minute conversation Steve Vai speaks about his practise regimen when he was young, his work with Frank Zappa, recording Passion and Warfare, working with David Lee Roth and Whitesnake, and many other ditties that I always find fascinating. Most importantly though, there are a bunch of beautiful gems about his philosophies and thought processes when composing music and playing guitar. Notably mentioned too is his outlook on music (not just guitar) as a whole, as well as his highs and lows during his career and his 30+ year monogamous relationship. My musical love affair with Steve Vai began somewhere in my teens when my then guitar teacher and now close friend and musical brother, Ross Tapson played me ‘For the love of God’. To be very honest I didn’t really have a clue of what I was listening to. All I knew is that it intrigued the holy crap out of me. There were sounds that I didn’t know existed. Playing that I couldn’t begin to fathom. But the hair on my arm stood up though… That much I knew. And that was all it took. I took home the pirated track and played it again and again, listening and trying to come to terms with what on earth I am subjecting my eardrums to. (At this time I was not listening to instrumental music at all, so really everything sounded like solos to me!) Slowly though, things started to make some sense. I listened the crap out of that tune. I was absolutely enthralled.. I obviously acquired the complete Passion and Warfare album and listened to the cassette until I completely wore it out. I then got another cassette and wore that one out as well! I studied Vai. I got a book with some transcriptions and worked through the tunes treasured within. I listened to everything of his I could get my grubby paws on. I even (somewhat dubiously) had a photo of Steve above my bed… I was just THAT much into his playing! As years passed and I got introduced to all kinds of other music and genres, I never got tired of listening to Steve Vai. To this day, no matter how much I’ve listened to his stuff in the past, it always sounds fresh and inspiring and jaw-droppingly great. And then YouTube came along… and all number of interviews and backstage antics got uploaded for anyone interested in whomever to take advantage of and troll to their heart’s content. And whom did I YouTube first? 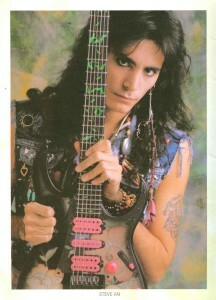 Yep, ol’ Mr Vai. I suppose the good thing is that I did not end up sounding like Vai. At least not all the time anyway. There are definite nuances and articulation of his that I shamelessly stole. There are certain quirks that I always add to my playing, but NEVER did I blatantly rip him off. And I guess that’s the biggest lesson I ever learned from Steve… To be original and to be oneself. Not to just copy what came before but at the very least try and assimilate your influences and fuse them into something that is YOU! That to me was his greatest lesson and his greatest gift to me. Every child would at some point or another be interested in learning to play an instrument and guitars being well accessible, taking up little space and relatively affordable is a great choice for parents wanting their child to learn about music. I have included some links to what I consider to be great instruments for the aspiring beginner guitarist at the bottom of this post. The dreaded budget is something we all have to consider in one way or another, and another extracurricular activity’s expenses may drive us up the walls! Luckily one can purchase an entry-level guitar for well under a £100. Your child’s age will be one of the determining factors in deciding which guitar to buy for them initially. If the child is under 11 years of age, a ¾ size nylon string guitar will work great in most instances. As mentioned below, we are all different so always take your child to a music store first, put a guitar in his / her lap and determine how comfortable they feel with a particular size of the guitar. Some young students may already know what music they are interested in playing. Listen to your child! If, for instance, he / she is listening to more rock orientated music it would likely be best to go with a steel string acoustic as opposed to a nylon string acoustic. He / she may even really prefer an electric guitar from the get-go. Following is an in-depth look at various guitars for beginner students and some pros and cons regarding this. I would always recommend NOT buying something too expensive to start off with as we never know if they will persist in this endeavour. If they love it and want to upgrade in the future, then only the time will be right to buy something pricier. Electric guitar or Acoustic guitar? In a nutshell, I personally think that it is better to start with an ACOUSTIC guitar. The biggest reason is that if you can play competently on an acoustic guitar you will be able to play competently on an electric guitar. Unfortunately it is not always true the other way round. Because the acoustic guitar requires more strength in the hands than an electric guitar, a person who has only ever played electric guitar will find switching to acoustic guitar rather difficult. Conversely if an acoustic guitar player were to take up electric guitar, the transition is a lot easier on both the fingers as well as the brain. Another reason I think it is better to start on an acoustic guitar is the price tag involved. One can purchase a very nice entry level steel string guitar for around £80. This is all the student really needs to practise and be able to learn. With an electric guitar one not only need the guitar (which start at around £70), but also an amplifier as well as cables. This may not be too much of a concern, but saving a few quid when unsure if this will be a long-term endeavour, is always welcome. Let’s take a closer look at various guitars to suit every child’s needs and get them inspired to play music! Nylon string guitars are usually the ‘go-to’ beginner guitar for children as the nylon strings are a bit more forgiving on the fingertips and largely recommended by guitar teachers and music shop sales assistants alike. Because the strings are made of nylon (even the bass strings are nylon which is wound with copper or nickel alloy) they are softer on the fingers and relatively easy to produce a decent sound on. Nylon stringed guitars are generally called Classical Guitars or Spanish Guitars. They come in different sizes and the ¾ size is commonly recommended for younger children. The ¾ size guitar is obviously of smaller built, but also the neck is slightly narrower and shorter in length, making playing chords for small hands a lot easier! Because they are tuned the same as their grown-up brethren (with a longer neck length) the strings are not quite as tightly wound, again making it easier to press down on the frets to create different notes relatively easily. These guitars are also very affordable and for this reason a great buy to get children up and going in their musical endeavours. Young children will obviously outgrow a ¾ size guitar sooner or later but because of its relatively inexpensive price tag that’s not too much of a worry. They make great gifts to be passed onto younger brothers, sisters, cousins or friends! Also if the child has carried on learning the guitar for a few years and still are enthused, it is well worth investigating an upgrade anyway! I would normally recommend a ¾ size guitar for young children up to around 11. Please remember that we are all different and that this recommendation is not written in stone! If the child is a little older it would be most preferable buying a full size guitar. Now, because the child is older he or she might already have an inkling of what music they are interested in playing. For this reason if your child shows interest in wanting to learn the guitar, I strongly recommend talking to them and trying to figure out what they are interested in. If they are not too sure, again I would recommend a nylon string guitar for all the reasons stated above. However this time it should be a full size guitar. As their hands, arms and tendons are by this time more developed it is usually better to get a full size guitar to avoid having to upgrade in 6 months’ time. Entry level Classical or Spanish guitars are very affordable and make learning the guitar easier on the fingers. Sometimes children are surprisingly sure of what they want and what music they would like to be able to play. They may have gotten interested in Taylor Swift or Oasis and the likes and thus a steel string acoustic guitar would be best suited to their needs. The steel string acoustic is, believe it or not, strung with steel strings as opposed to nylon strings. The first two strings closest to the floor are unwound and called plain-steel strings, where the 4 strings closest to the ceiling are wound usually with a copper, zinc and brass alloy. The steel string acoustic guitar has been traditionally used to play all kinds of Folk music and works very well for strumming chords around the camp fire! The neck is also slightly narrower than a Classical guitar making it a little easier to play open-string chords. However, the steel strings do bite! Because the strings are made of hardened steel and are strung quite tight, it takes more force to push down on the strings making the fingers feel the workout a lot sooner. Luckily we develop calluses quickly if we play 10-20 minutes every day, so the fingers should settle and be hardened very soon! Steel string guitars are used for playing anything from Bob Dylan to Oasis, from Queen to Radiohead to Al di Meola. It is a mightily versatile instrument! As the student becomes more adept and comfortable in playing this guitar he or she will progress to learn a number of songs quickly as the repertoire is so vast and using very similar chords. The steel string acoustic guitar is usually only found as a full size guitar and is a little dearer than nylon stringed guitars. You can find a very nice steel string acoustic guitar starting around £70. I would recommend getting a steel string acoustic guitar if the child is a little older and shows interest in rock and pop music. As said before the steel string acoustic guitar is a very versatile instrument and one can produce all kinds of sounds and music on it. Have a look below at some remarkable feats on this instrument. The electric guitar needs an amplifier to produce louder sounds. Unlike the acoustic guitars above, and electric guitar frequently features a solid wooden body and for that reason weigh more than its acoustic brother. It is also strung with steel strings but the strings themselves are a lot thinner than acoustic guitar strings. The main reason for this is that one of the most characteristic traits of an electric guitar is the ability to bend or stretch the strings. This produces blues and rock sounds that in general cannot be accomplished with acoustic guitars. Sound is picked up by what is called… wait for it…. Pickups! It’s really just a coil with some magnets inside and this in turn picks up the strings’ vibration. The signal is then sent via a wire to an amplifier which amplifies the sound and then sends it out a speaker and into our unsuspecting eardrums. On the plus side, amplifiers have indeed got a volume control, so one can play it at low volumes, making it perfect for practising while having people over for tea! For the reason that one needs an amp, this makes for a bit more of an expensive enterprise, but if the person is interested, a very cool endeavour indeed! If your child is listening to more rock-orientated music it is well worth investigating buying an electric guitar! My first guitar was a steel string acoustic and I believe that I would not have progressed as quickly as I did had I started on an electric guitar. It trained my fingers to be accurate and strong, so when I got my first electric it was a quick and smooth transition. Nylon string guitars, steel string guitars and electric guitars are all tuned the same (in standard tuning), so if you know some things on an acoustic it is relatively easy making the switch to an electric guitar. Again I would start with a guitar that is not too expensive and upgrade as the student progresses and their needs change during future years. Below are some great beginner acoustic and electric guitars to browse! Randy Lau getting the Funk out. Randy Lau is a super talented guitar player hailing from Hong Kong, currently residing in Cambridge, UK where I had the privilege of teaching and couching him. His influences include Jason Becker, Randy Rhoads and Marty Friedman amongst many others, and they shine through in his improvisations and stylistic approach. Randy recently discovered Nuno Bettencourt and is now totally enthused by the tapping arpeggios Nuno uses in many of Extreme’s tunes. Nuno is not only a technical virtuoso but has a lot of feel to his playing and great sense of composition. The whole of Extreme’s ‘Pornograffiti‘ album boils over with funky riffs, catchy hooks and blazing guitar playing. Randy recently did a concert for ‘Cambridge School of Visual and Performing Arts‘ where he studied, and pulled off the above song, as well as ‘He-man woman hater and Flight of the wounded bumblebee‘ with grace and conviction far beyond his 18 years on this planet. Randy will now be moving to London where he will continue his musical studies and I wish him the best in life and his musical career. Keep an eye on this kid! – Randy, it was a privilege teaching you mate! Fellow Guitar Teacher and master musician, Stefan Joubert had me answer a few questions about my playing, inspirations, guitar lessons and mentors. Stefan and myself studied under Johnny Fourie, Kevin Davidson and Marc Duby at Tshwane University of Technology many moons ago and I remember this fondly as the best education I have ever received. Musically and otherwise. Stefan was quite the obsessive little dude, always to be found with a guitar in his hands. Grab a coffee and enjoy this comprehensive interview and then check out Stefan’s site after you’re done. Guitar Lessons in Peterborough – Blues! John jamming over a blues backing track at John Welch School of Guitar. John playing over a very nice little rock ballad at John Welch School of Guitar. John playing over a Joe Bonamassa style backing track at John Welch School of Guitar. This Video was made a few years back when I entered the Dean Shred competition. I composed the music to be within 1 minute of length as stipulated by the rules. This particular piece showcases some of the techniques i use most often which includes Alternate Picking, Tapping, Sweeps, Legato (Hammer-ons and Pull-offs) and Hybrid Picking. This tune incorporates what speed should be about for me personally in that there should be thought put into the notes as well as overall structure of a particular piece. All of these techniques will be covered in depth for those who are up to the challenge in our Guitar Lessons at John Welch School of Guitar.